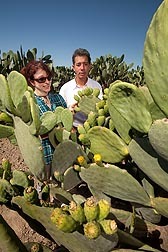 ARS plant/soil scientist Gary Bañuelos and horticulturist Gabriella Romano survey fruit on prickly pear cacti, Opuntia ficus-indica, at the ARS San Joaquin Valley Agricultural Sciences Center in Parlier, California. The west side of the San Joaquin Valley in California presents several challenges to growers. Ancient seas that once covered the area left behind marine sediments, shale formations, and deposits of selenium and other minerals. Anything grown there needs to be irrigated, but the resulting runoff, when it contains high levels of selenium, can be toxic to fish, migratory birds, and other wildlife that drink from waterways and drainage ditches. Selenium runoff is subject to monitoring by regional water-quality officials. Periodic droughts and population growth are also squeezing supplies of the fresh water available for irrigation. 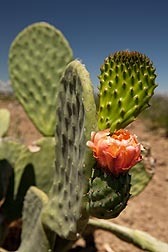 Newly emerging cladode with flower on field-grown prickly pear cactus, Opuntia ficus-indica. “We need to find a way to keep the land productive, but that becomes difficult when you have environmental concerns stemming from soils with these mineral deposits,” says Gary Bañuelos, an Agricultural Research Service plant/soil scientist with the Water Management Research Unit at the San Joaquin Valley Agricultural Sciences Center in Parlier. Bañuelos believes that he has found a promising alternative: prickly pear cactus (Opuntia ficus-indica), a drought-tolerant plant. Bañuelos’s studies show that certain cacti tolerate salty soil and take up selenium from it. “We’re hoping to produce a new crop on unproductive land and slowly manage the selenium content of the soil in the process of growing it,” Bañuelos says. 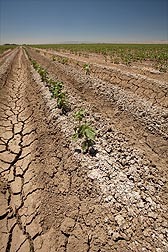 Typical salty and selenium-laden soil planted to cotton in the west side of central California. Bañuelos and his colleagues from the University of Palermo, Italy, initially evaluated varieties of O. ficus-indica from the USDA-ARS National Arid Land Genetic Resources Unit at Parlier, which maintains and evaluates plant germplasm adapted to arid conditions. The team’s evaluation focused on the ability of different varieties to tolerate poor-quality soils in greenhouses. Partners in Palermo included Viviana Catanese and Giuseppe Alonzo. 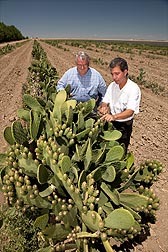 After making those observations, Bañuelos then spent 3 years evaluating five prickly pear varieties from Mexico, Brazil, and Chile for salt and boron tolerance in selenium-laden soils by collecting soils and sediments from the area and growing the varieties in field test plots at the research center in Parlier. He followed normal agronomic practices for the area and used a drip irrigation system that produced very little runoff. 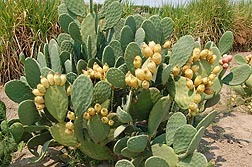 Results, published in Soil Use and Management, showed the prickly pear grew reasonably well in the poor quality soil with very little water. Unexpectedly, the plants also took up selenium, volatilizing some of it and keeping some in their fruit and leaf-like stems (cladodes). Other nonessential minerals were not found in higher concentrations in these plant parts. 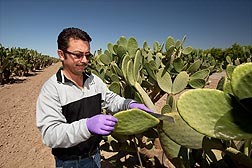 At the USDA-ARS San Joaquin Valley Agricultural Sciences Center in Parlier, California, technician Irvin Arroyo cuts a cladode from a prickly pear cactus. 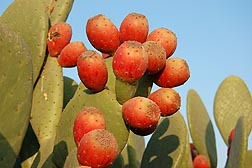 Prickly pear was thought to be sensitive to high salinity. But the study results showed that tolerance to salt and boron depends on the genotype. 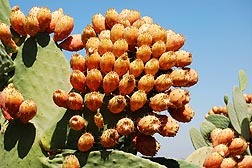 The cactus variety from Chile had the highest tolerance and was the best at producing fruit and accumulating and volatilizing selenium. Many of the plants grown in test plots were smaller and produced less fruit than those in control plots, but some varieties actually grew better in the test plots. The results were promising enough for selected prickly pear varieties to be considered as a gentle bioremediation tool for soils loaded with selenium. “We’ve found this plant needs minimal amounts of water, plus it can survive in these saline and boron soils laced with selenium,” Bañuelos says.—By Dennis O'Brien, Agricultural Research Service Information Staff. ARS plant/soil scientist Gary Bañuelos (right) and grower John Diener survey prickly pear cactus growing well in poor-quality soil. This research is part of Water Availability and Watershed Management, an ARS national program (#211) described at www.nps.ars.usda.gov. Gary Bañuelos is in the Water Management Research Unit, San Joaquin Valley Agricultural Sciences Center, 9611 S. Riverbend Ave., Parlier, CA 93648-9757; (559) 596-2880. "Using Cactus as a Bioremediation Tool" was published in the January 2012 issue of Agricultural Research magazine.